Augmented reality marketing has made a spectacular entrance into the furniture business with the industry giants such as IKEA, Wayfair, Ashley furniture, Houzz, even Amazon. And as sales figures show, these companies were extremely smart to adopt AR. Especially considering that furniture is the product that people are most willing to buy using augmented reality. Which is logical, for what are the main customer objections when buying new furnishings? Journey to the shop, hesitations about the style and size choice. All of which AR eliminates! So if you are not using augmented reality right now, ask yourself: aren’t you afraid of getting far behind the competition? For by 2021, most mobile owners will use AR apps! It’s like having all your customers gathered in one place, waiting for your product to be presented. Since they are all on the phones rather than in shops, you either lose them or find a way to reach out. Confused about what to begin with? 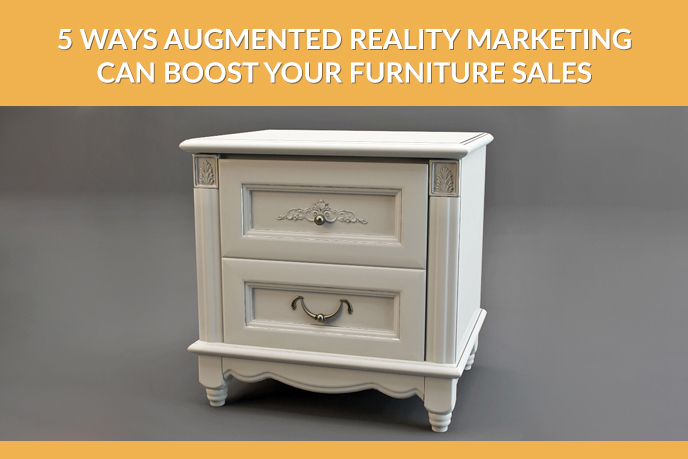 Then take a look at top 5 opportunities of Augmented reality marketing that are already transforming the way furniture business works. .
Professional product images are a great tool, but they are even greater when paired with AR catalogs. Now that IKEA has shown its simplicity and effect, the world has gone crazy with the power of choice it gives. Customers now stay at home, download a mobile application and chose the furniture that really fits their room. Practical, easy and so much fun! Very family-friendly. These ideas were at the core of the following IKEA marketing campaign, and the catalog reinforced the image. What IKEA have not included in the commercial, however, is that by its nature, Augmented Reality catalog creates a favorable atmosphere for cross-selling and up-selling. Let’s see how it happens. In a physical store, visitors are often too shy to look at expensive products. They just shy away from them and questions of the Shop Assistant, and proceed to more realistic goals. Meanwhile, owing to augmented reality marketing, they can look at any options without feeling awkward. Imagine that the customer likes that elegant and classy table from your new collection. So he projects it into the room, walks around, takes his time to think. He realises how cozy it makes the dining room feel. The guests will be comfortable, and the family will love it! Moreover, with that exquisite quality and stylish reserve, it’ll serve decades and will always look trendy. The investment is definitely worth it. And there are installment options! As a result, the client will make a purchase and fully benefit from your fine product. Everyone’s happy! Let’s start with engaging customers experience. It takes nowadays more than a great product and nice store to lure a shopper out of his mobile device… But wait. Why resisting the mobile? Let’s unite forces! Imagine your client coming to the store to really interact with the furniture. He has chosen the sofa, has sat on it, felt its velvety texture, marvelled at the beautiful emerald green color and found it incredible. Now comes the time for augmented reality marketing. The visitor points his phone on the sofa and sees it in various colors - golden chic, aggressive scarlet and mysterious black. He considers his options, makes a choice and decides to try accessories from the catalog. Want more fun? Create entertaining realistic illusions with some additional equipment. Like cute kittens running around and playing on the sofa or something - depending on the the product and type of customers. Chances are, you’ll go viral. Want to go even further in taking a customer experience to a next level? Provide shop visitors with the opportunity to see information about the product on their phone screens using AR app. Materials, recommendations, suggestions, design styles. As well as that, mention what your brand is actually about. For instance, how you ensure the finest craftsmanship ever and how proud you are to be part of Fair Trade. Webroomers prefer to choose furniture online. This way, they can compare models, prices and purchase conditions without leaving home or at work. But they to buy the object, they go to the physical store. For that allows to see it for real before paying and maybe to avoid paying for delivery. Showroomers basically do the opposite. The choose the exact model in the store itself, but then go home and compare the prices and conditions offered by shops. Upon which, they make an order online. How to please both camps at once? Use AR to improve customer service online and offline. Go cross-channel! Create an online webroom for the first type of clients to choose and for the second - to buy in. Augmented reality marketing can help you attract plenty of attention. This option has already been explored by such companies as Coca-Cola, PepsiCo and Lacoste. Obviously, the exact solutions should be developed by your marketing department and maybe a creative agency you partner with. But there are two main vectors: sheer fun and a serious cause - a charity, for instance. PrepsiCo marketing campaign is about entertainment. By replacing a bus stop shelter with an HD screen, the brand projected fun images. And then… Something explodes just two feet from the bus stop - while nothing of the sort happened, of course. Or aliens suddenly arrive. The reaction of viewers was filmed and posted on Youtube, and the video in 7 days brought PepsiCo 24,000 shares and 2000000 views. Not bad! This battlefield for customers’ attention is the newest one, but it definitely is promising. Facebook, as an extremely AR-friendly social media, is a great place to boost brand-awareness and sales through gamification. If the furniture design is youth-oriented, Facebook is the right place to reach out and AR is the language youngsters will respond to. Encourage the target audience to share their experience of interaction with your brand and really spark their interest! Augmented reality marketing is the future of furniture sales. And what can be a better strategy than to start your future today? Follow the market leader and explore these options. They are a goldmine for creative solutions! And to get high-quality 3D modeling services for your Augmented Reality campaign, contact UFO3D. We’ll provide you with beautiful visuals and advice!